Brew both Springtime Oolong with Ginger and Gentle Minty Green Tea together, according to your preference in strength. Simmer rhubarb, berries, honey and Yata Watte tea until syrupy, then strain and add lemon juice to taste. 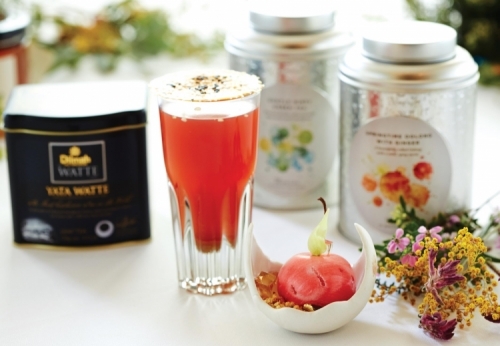 In a glass, pour the prepared rhubarb, berry, honey and Yata Watte tea syrup. Top the glass with the sugar sesame wafer and pour the prepared hot tea through the wafer. * Prepare the sugar sesame wafer by bringing sugar to soft ball consistency and adding the black and white sesame seeds. Pour over a baking sheet and allow to cool. Cut or break to the desired size to fit over your glass.